A couple of days have passed since I finished my Senior Project at Tri-State Bird Rescue and Research and things are finally starting to get back to normal. “Normal” is kind of a strange word though because it wasn’t long ago that taking care of sick and injured birds for eight hours a day was normal for me. Well, regardless of what is and isn’t normal, my Senior Project is done and Spring Break is slowly coming to a close. It’s nearly time for me to return to Westtown and share my experience with both my peers and teachers, but the problem is I am not entirely sure how to do that. I could share my experience in the sugarcoated version, which would be that each day I had a pleasant 50 minute drive down I-95 in the morning and taking care of the birds was a piece of cake. That wouldn’t be the truth though. The truth is that I had a horrible 50 minute drive each morning with cars going 25 mph over the speed limit zipping by me and nearly crashing into me. The truth is that in order to prevent the birds food I had to cut open mice with pairs of scissors and inject them with meds. The truth is that every couple of days a bird would poop on me and it would stain my sweatshirt and make me smell for the rest of the day. I think when I tell my friends at school (at least the ones who aren’t reading this right now) I’ll tell my story somewhere between the two versions. No matter how I let everyone know about Tri-State, I will never be able to put into words how grateful I am for the experience to volunteer for the past two weeks. Working with the birds has confirmed my suspicion that I would like to work with animals for a career, but I am not sure in exactly what form yet. I guess that’s what college is for! Anyways, I think I will finish my blog with the same picture I used to start it. Here is a photo of Tri-State Bird Rescue and Research located in Newark, Delaware. Hopefully this won’t be the last time I volunteer and help the birds recover! To all of my readers, thank you so much for sticking with me for the past couple of weeks and being a part of my experience. Once again, thank you and goodbye! P.S. If you have the chance or live close to Newark, please check out Tri-State because the work they do is incredible and all donations are appreciated! Vulture plate. 6-10 pieces of chopped up chicken breast, 6-10 pieces of old fish (any will suffice), one quarter cup of soaked dog kibble, 1-2 egg yolks, and 1/2 tablespoon VitaHawk sprinkled on top. Songbird platter. A layer of dog kibble topped off with a couple spoonfuls of crushed grapes sprinkled with a little bit of egg yolk. If nothing else, I will take away these recipes, which have been ingrained in my head, from my time volunteering at Tri-State. The only problem is that there is a 99% chance I will never have to make them again after tomorrow. It’s strange to think that tomorrow is the final day I will have to wake up at 6:45 and make the 45 minute drive down to Newark, Delaware. It’s the last time that I will be putting out bird feeders with the bitter wind biting my fingers early in the morning. It’s the last time that I will be preparing food stuffed with meds for birds in need. It’s the last time that I will be sweeping floors and cleaning dishes, that is, of course, assuming I don’t get wash for my next work job rotation! Most of all though, I am going to miss working with the other volunteers to quickly come up with a strategy for cleaning a cage while a bird is temporarily being inspected by the veterinarian. While the cleaning is stressful in the moment because of the time constraint, there is something especially satisfying afterwards when we can all come together and laugh about how we somehow managed to defy the odds. The bird that I am specifically thinking of is a 4th year Bald Eagle, which is pictured below. What’s different about a 4th year from the common adult eagles you guys probably think of is that a 4th year eagle has a dark grey/white head because it hasn’t fully matured, which is indicated by the color of the eagle’s head. The traditional adult eagles, which all of you probably think of, have completely white heads. Here is a picture of a 4th year Bald Eagle. Although my 61 hours of volunteering at Tri-State so far is impressive, it is nothing compared to the many volunteers whose total hours of service number in the hundreds. However, despite my lack of experience compared to them, this week I was asked to help train another high school volunteer who was interested in bird care, which is what I am primarily doing at Tri-State. My main duties for each bird are to clean their cages with a hose, swap out their water bowls and bath pans for new ones, prepare their food (which can vary from simple wild bird seed for songbirds to a plate of chopped up chicken, fish, dog kibble, rodent, and egg yolk for a vulture), and give them their meds in the food. Now, I can easily and confidently describe this process to you guys, but a week ago when I was a rookie that wasn’t the case. Since I’m so new to Tri-State and the in’s and out’s of the facility, and because I am in high school, it was easy for me to connect with the 16-year-old junior shadowing me. Getting to train another volunteer was a nice change of pace from the daily routine I have fallen into. It’s funny because even though in reality I’ve only been volunteering at Tri-State for a week, it feels like a lifetime of work since I have been coming in every day from 8-4. 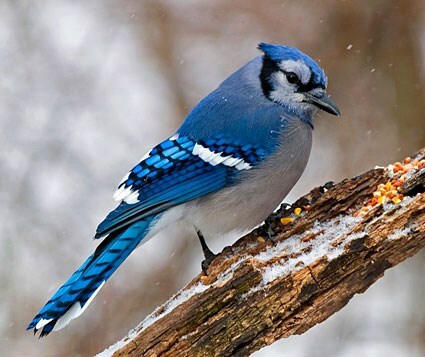 Seeing the big smile on my shadow’s face as we cleaned the cage of a Blue Jay (pictured below) reminded me of my own joy just eight days ago when I first started volunteering at Tri-State. It’s crazy how quickly the roles have reversed! I have outgrown my novice status and become not only a master of bird care, but a teacher of it as well. Do wash your hands between caring for each bird because many of Tri-State’s patients are infected with contagious diseases such as Giardia or Finch Eye. Don’t put food in a Red-Tail Hawk’s cage without using tongs since they are food aggressive and will fly at you to take the food directly out of your hand. Do reuse food if the bird doesn’t eat all of it overnight because at a non-profit organization saving food=saving valuable money. Don’t forget to hangup the hoses when not in use as the water in them may freeze and make them difficult to use the next the day. These are just a few of the many important do’s and don’ts I have learned in my first four days volunteering at Tri-State. However, each day I am asking fewer and fewer questions and I seem to be falling into a daily routine. I arrive at 8 in the morning, get briefed on the birds in house at the volunteer meeting, work outside and take care of the birds for however long that takes, and then do any tasks the supervisor of the day needs done until 3, which is when the PM bird feeding begins. In a normal day, I probably care for about five birds or so by myself and then work with other volunteers to take care of the cages containing more than one bird. Currently, there are around 30 birds in house including three Bald Eagles and eight Red-Tailed Hawks. Below is a picture of a Red-Tailed Hawk. Watching birds like these hawks soar in the flight cages to build-up muscle strength in their wings again has been incredible so far. The chance to not only get up close and personal with these birds, but to actually assist in their recovery by putting medicine in their food and such, has been one I won’t forget. Although cutting open a dead mouse’s stomach and filling it with medicine isn’t most peoples idea of fun or interesting, there is something serene for me in this “gross” action. I find peace in the fact that my volunteer work is helping to save the birds at Tri-States lives, and I am eagerly looking forward to continuing my work throughout the next week and a half. Hi everyone, I have a question for all of you. Do you like birds? Regardless of your answer, if you passed by a hurt bird on the side of the road or saw a baby bird stuck on the ground in your backyard, would you try to save it? Well, taking caring of injured birds is what Tri-State Bird Rescue and Research is all about. Although I have already completed three volunteer training sessions and know my way around the facility, I am sitting here tonight scared for what tomorrow, the first official day of my project, holds. I’m terrified of not putting enough Vitahawk, a vitamin supplement, in the raptor’s food or forgetting to put a rock in the birds water dishes since they don’t have any depth perception. I just don’t want my forgetfulness or lack of knowledge to affect the birds I’m taking care of in any way. Hopefully everything turns out alright. Fingers crossed! Please check out my blog over the next two weeks to learn about my experience and hopefully see some pictures of the birds I’m taking care of!